Whether you need to repair your air conditioning equipment, install a new air conditioning system, or just routine service - it’s important to have a reliable company you can trust. 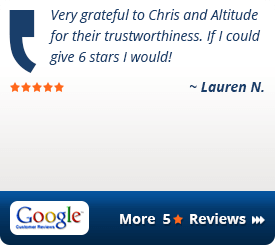 Altitude Comfort is a family-owned and operated company with over 20 years of experience providing Denver and surrounding areas with five-star service backed by our 100% Customer Satisfaction Guarantee. Altitude Comfort’s certified technicians can repair, install, and service all brands of central cooling systems, and our high-efficiency cooling solutions are guaranteed to help you save money by lowering utility bills. 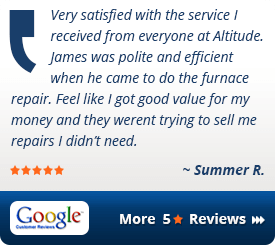 Altitude Comfort has earned our reputation as a highly rated heating and air company by providing Denver with fast, emergency air conditioning repair service backed by our 100% Customer Satisfaction Guarantee. We even offer financing options with low monthly payments for major air conditioning system repairs. We’ll restore the comfort of your home quickly and affordably. Our professional HVAC technicians have everything they need to complete your repair on the spot. Altitude Comfort’s highly-trained and certified Denver air conditioning technicians are available 7 days a week and can repair all brands. You can always ask one of our experts if you have questions about your home’s air conditioning. We can even find the lowest monthly payment option available so you can replace your air conditioning system today - without putting a dent in your savings. Our financing partners have programs to fit every situation. Click here to learn more about financing. 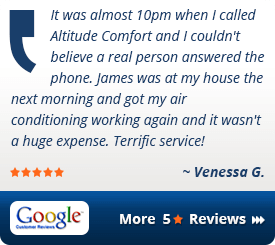 Altitude Comfort is Denver’s expert air conditioning replacement specialists. Our certified technicians provide free, no-obligation consultations on replacing your current air conditioning equipment. We design your new cooling system to optimize the energy efficiency of your home, which helps your new system pay for itself by lowering your monthly energy costs. Call us now at 303-505-3406 for a No-Obligation free replacement estimate on replacing your old air conditioning equipment with a brand new, high-efficiency system. 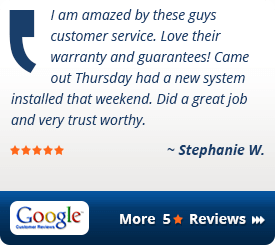 Or schedule a free replacement estimate online now by clicking here. The most common cause of equipment breakdowns and air conditioning repair expenses is lack of proper maintenance. Without regular maintenance and tune-ups, utility costs will begin to increase as equipment runs at less than peak performance. Annual inspections of your cooling equipment ensures performance, longevity, and safety. You can trust Altitude Comfort’s factory-trained technicians to maintain your air conditioning equipment, and help keep your utility bills as low as possible. Our comprehensive HVAC maintenance service includes safety checks, cleaning, filter changes, lubrication, mechanical testing, and all other maintenance required for your particular system. Call us now at 303-505-3406 to schedule maintenance service for the air conditioning system in your Denver home or business. To get in touch with a Altitude Comfort team member, or to request a free replacement estimate on a new air conditioning system for your Denver home or business, call us at 303-505-3406 today!